Jon (JonB) Brobst is the president and owner of PartsRack Inc. Jon has been active in Dodge Motorsports since 1991, and was initially hooked on Vipers because of his passion for Pace Cars. Jon's Stealth Twin Turbo pace car was featured in the September 2001 edition of Mopar Performance News. Since 1993, Jon has owned over 15 Vipers and has been helping fellow Viper owners understand and appreciate their cars ever since. His passion for the car caused him to retire early from his 33 year professional career and devote all his energy to Vipers. He says his passion for the Viper has never faded since owning his first Viper in early 1993. 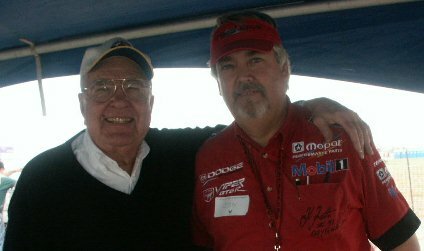 In 1995, Dodge Motorsports invited Jon and 13 others to an exploratory meeting that resulted in the founding of the Viper Club of America. Jon was elected to 3 terms as a national officer of the club, and he served as NW regional club president for 9 years. He has sponsored numerous regional and national club activities since 1996. With almost 50,000 track miles to his credit, Jon has been a NW driving instructor, and occasionally for Viper Days-NARRA, since 1996. He is an Official Pace car driver of the Dodge Viper Cup series for 2010. Some of Jon's favorite events are the Viper Owners Invitationals. Jon has attended every one since 1994, and PartsRack has sponsored events or activities at VOIs since 1999. Co-driver Doris Rose joined the PartsRack team in 1999, and has owned 4 Vipers since then. Doris also shares the official pace car duties at PIR and NARRA. Jon has organized or participated in numerous kids' charity events and has helped raise over $175,000 in donations for the regional children's hospital in Portland since 1993. Regional Viper clubs benefit from PartsRack's donations to their charities. Need help? Just ask! You can see several of Jon's Vipers in some cool DVD Video games. PlayStation Test Drive 5 has Jon's GTS (the first retail delivery) on the game cover, and it can be selected inside for a test drive. Microsoft, located in the NW, has 'borrowed' 2 of Jon's, and 1 of Doris' Vipers (2006 FED Coupe -1st delivery-; 2008 ACR; 2009 ACR) for its X-box 360 games, where you can chose a car, choose a track, and take these great Vipers for a drive. Look for a PartsRack sign, trackside in Project Gotham 3! If you are a Viper owner who is passionate about your car, who wants a no-bull approach to upgrades, maintenance or repairs, why not "share your passion" with a fellow hands-on enthusiast with over 17 years experience? Please, give Jon a call, or send him an email.